Our partners provide the sustaining support necessary to help us meet the growing needs of the community. When a community as large and diverse as ours comes together, it’s a beautiful thing. From the dedicated individuals whose passion has fueled our organization since the very beginning, to our partnerships with local and federal agencies, foundations, and businesses, we value each relationship deeply. Because we know that only by working together can we continue to provide nutrition for all. Anthem Blue Cross Blue Shield of Georgia Foundation, which is committed to improving health and strengthening Georgia communities, recently awarded a $50,000 grant to promote the prevention and treatment of chronic diet-related disease through the collaborative efforts of Open Hand Atlanta, Wholesome Wave Georgia, and Grady Hospital. 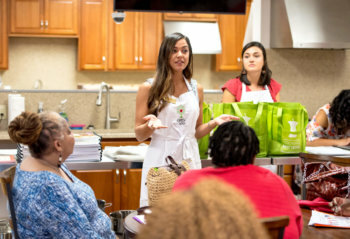 The program unites two evidence-based behavioral and preventative health programs: Wholesome Wave’s Fruit & Veggie Prescription Program (FVRx) and Open Hand Atlanta’s Cooking Matters, and one of the nation’s most prominent public hospitals with a history of caring for Atlanta’s most under served residents. Potential participants are screened for food insecurity and chronic disease, and Grady physicians then enroll food insecure patients with diet-related illnesses (i.e., diabetes, hypertension, obesity) in the 26-week program. FVRx provides affordable access to fresh fruits and vegetables over the course of the program, and Cooking Matters educational interventions are led by Open Hand Registered Dietitians, with a focus on improving overall nutrition knowledge and the adoption of healthy eating and resource management behaviors. Ongoing clinical care is provided by Grady Registered Dietitians. Success of this collaboration to cultivate an outcomes-driven FVRx Program at Grady as a model for growth across the state is essential to each organization’s individual and collective goals: to decrease Type 2 Diabetes by stabilizing or reducing biometric clinical data (BMI, A1C); improve medication adherence; improve awareness of the importance of healthy fruits and vegetables in the participant’s diet; increase daily consumption of fruits and vegetables; reduce food insecurity; lower healthcare costs evidenced by fewer ER visits and/or hospitalizations; and reduce medication usage. Through charitable grant making, the Blue Cross and Blue Shield of Georgia Foundation LLC, an independent licensee of the Blue Cross and Blue Shield Association, promotes Blue Cross and Blue Shield of Georgia’s inherent commitment to enhance the health and well-being of individuals and families in communities that the company serves. The Foundation focuses its funding on strategic initiatives that address and provide innovative solutions to health care challenges, as well as promoting the Healthy Generations Program, a multi-generational initiative that targets specific disease states and medical conditions. The Blue Cross and Blue Shield names and symbols are registered marks of the Blue Cross and Blue Shield Association. Engaging with the public, private, and independent sectors, Open Hand partners serve as advocates, educators, and spokespersons to advance the case for philanthropy and to inspire other business leaders to make a lasting commitment to community giving. Of course, there are those who go above and beyond with generous contributions of time and financial resources, consistently demonstrating their commitment to improving the quality of life for underserved individuals in our community living with or at risk for chronic illness. These sustaining partners are integral to Open Hand’s efforts to keep pace with the growing demand for nutrition services, and we are honored by their support. Open Hand Atlanta believes in partnering with the community to positively impact health and social services, and we work closely with over 100 other nonprofit organizations throughout the state to implement collaborative programs that address these issues. It is only through these valued collaborative relationships that Open Hand Atlanta is able to carry out our mission and touch the lives of thousands of those in our communities that would not otherwise receive the nutrition support they so desperately need.